Alabama Hill Market neighborhood statistics for June 09' - Bellingham Real Estate Looking to buy or sell in the Alabama Hill area of Bellingham? This neighborhood report will give you an overview of current properties on the market, pending homes that are on their way to the closing table, and properties that have sold from April to present. Currently I'm using a 3 month history to evaluate value. For a more accurate analysis, upon request I'll narrow the search to your liking. This will give you a clear picture of present activity, as well as, what has happened over the last few months in the Alabama Neighborhood real estate market. Of these properties there are 1 alabama hill short sales, 0 bank owned properties & no estate sales. Of these homes for sale there are 1 bank owned property, 1 short sales, & no estate sales. 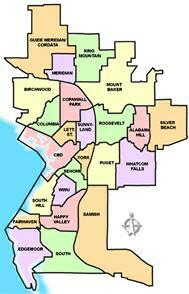 Search Bellingham bank owned real estate, Bellingham Short Sales, or Sell in Bellingham. About the Author: Tara is a full time Realtor in the Bellingham, Wa. She specializes in under-valued properties - good deals, bank owned real estate, short sales, estate sales, etc. She is well versed in real estate values, finance, and negotiation. Whether you're looking to relocate, buy, sell, or invest you're in good hands with Tara.